Dermaplaning is a safe, highly efficient physical exfoliation procedure used to clear away dry, dead, superfluous skin layers as the first step in a Micropeel. This procedure is performed by AMS’s medical skin care specialists who are trained in the use of a modified surgical blade designed specifically for this purpose. Dermaplaning is a non-surgical procedure that helps you achieve healthier and more vibrant skin. It immediately diminishes the appearance of dry, fine lines that are evident on aging skin. Since dermaplaning removes dead skin cells, skin care formulations are absorbed more efficiently and results are remarkably improved. During the procedure, we will gently stroke a sterile surgical blade along your face to remove dead cells. Then we will apply an enzyme mask or chemical peel to penetrate the deepest layers of your skin and ensure an absolutely radiant complexion. 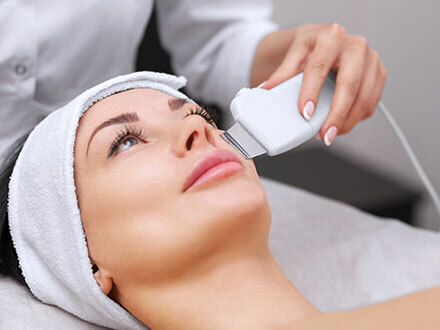 Dermaplaning is an extremely gentle, non-invasive procedure that rarely has any side effects. When they do occur, they are usually very minor, and may include temporary redness, dryness, and flaking of the skin.